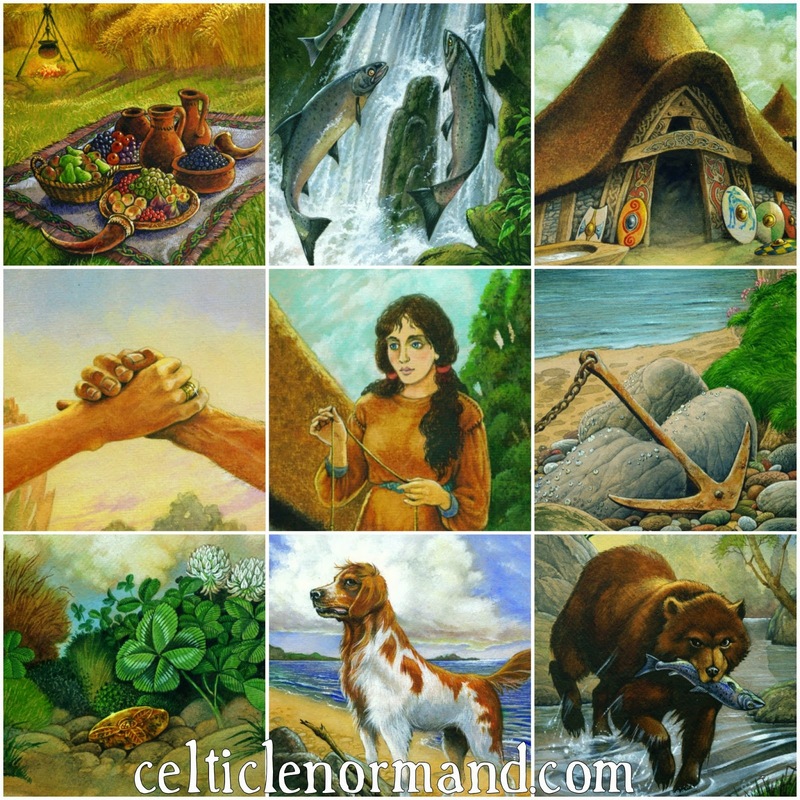 The Celtic Lenormand Oracle: Lammas Blog Hop - Who is the Queen of Pentacles? Lammas Blog Hop - Who is the Queen of Pentacles? For this round of the Tarot Blog Hop, Joanna Ash, the divine Sun Goddess, asked us to write about the Queen of Pentacles. Which is a lovely topic, but this is a Lenormand blog... Worry not, I decided to look at how Lenormand cards might describe a Queen of Pentacles woman! One way of reading a 3x3 (nine square) in Lenormand is to read each card in the round as related to the centre card. So, placing the Woman card at the centre, we build a description of the Queen of Pentacles. The choices made here are based on the keywords I use for cards. For instance, I see in the Bear the wise use of resources (it's the "manager" card), and I also relate it to mothers. Although the Queen of Pentacles likes to spend money (Fish), she does know how to make the most of what she buys, and is very motherly. Likewise, the Garden (Meadow in the Celtic Lenormand) is related to social events, and so to hospitality, a definite trait of this tarot Queen. The Queen of Pentacles is also loyal (Dog), focused on her home and family (House) and doesn't shirk her commitments (Ring). She is hard-working (Anchor), and makes the most of the opportunities (Clover) that present themselves. Some people are sure to choose different keywords for these cards. So, which cards would you choose to describe the Queen of Pentacles? P.S. If you enjoy these blog hops, you can join the Blog Hop Community page to be informed when they take place and have your say in future topics etc. And if you want to join the hop yourself, just ask! It's a nice way to explore what you think about someone, and then reading it with more traditional positions can also be insightful! What a fabulous thing to do with the Lenormand. Really enjoyed this. What an excellent description of the Queen! And your cards look so rich and inviting! I did wonder how you were going to use Lenormand to describe the Q of P.. What a great idea this was.